Mother's day is a special day for everyone. Mothers get treated like princesses for a day, and we get to give recognition and an abundance of love and affection to the women who made us. Posterjack is one of those places that can help when you want to put an extra big smile on the face of the one you love. They can take one of your memories, and make it last forever. No joke. My son, Kris, My daughter, Brianna and myself. With my children being older, one is away at college, it is harder to get moments where memories are made. When they are, it is nice that Posterjack can help make it something I can display as art. Take this acrylic block, for example. While my daughter was visiting from college for Easter, we snapped this selfie, and being so long since I had a photo of all of use together at once, it is the perfect Mother's day gift to myself. My two heartbeats are proudly displayed in my office. If you’re looking for a little Mother’s Day gift inspiration that will make you look like the most thoughtful person on the block, look no further than Posterjack. Posterjack, Canada’s photo-to-art experts, takes Mom’s favorite photo memories and turns them into stylish photo art on framed photo, canvas, metal, acrylic, wood prints and more. 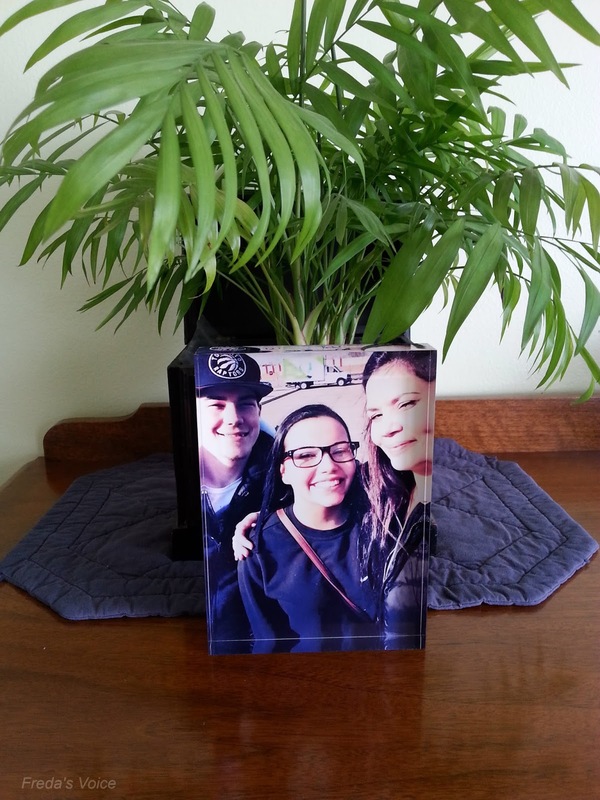 I ordered an acrylic block, which is a one-inch piece of premium cast acrylic with a photo printed inside. It definitely adds sparkle to my desk! Since Posterjack delivers right to your door, you get to relax, sit back and accept praise for getting her such a thoughtful gift. **No compensation was received for posting. Opinions and photo are owned by Freda's Voice. We have been using Posterjack for about 5 years now. I love the acrylic block. I had one done recently of my son proposing to his g/f. Lovely review. Do stop by my blog.